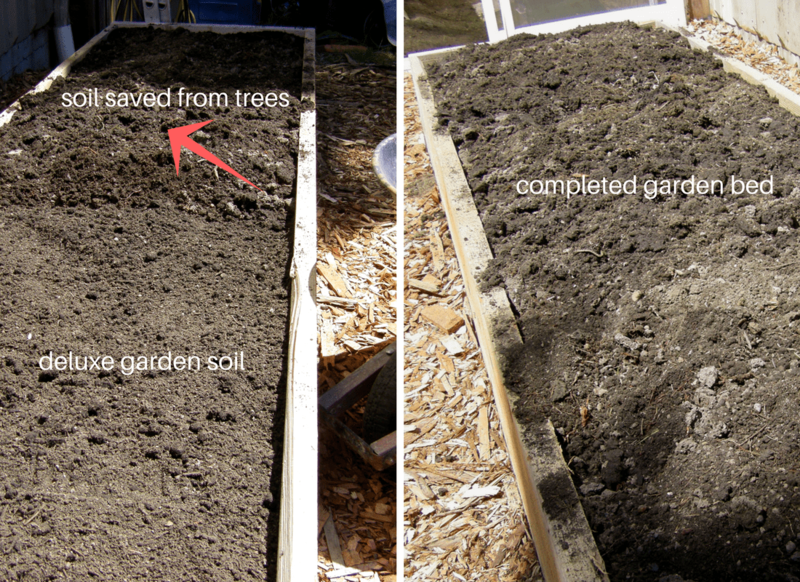 I call it a raised garden bed with modified hugelkultur as a true hugelkultur garden is made up almost entirely out of logs and wood and just a little bit of dirt (2 inches). Doing a bit of reverse, but hoping to still get the benefits we did a raised garden bed with a layer of logs, then 10 inches of dirt. 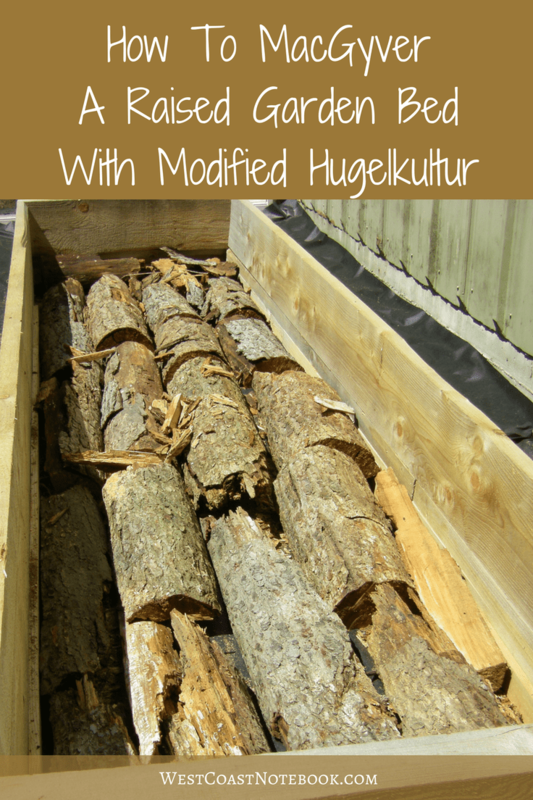 So… what is a hugelkultur (pronounced Hoo-gul-culture) you ask? Basically is a pile of organic material that is built up to form a mound. 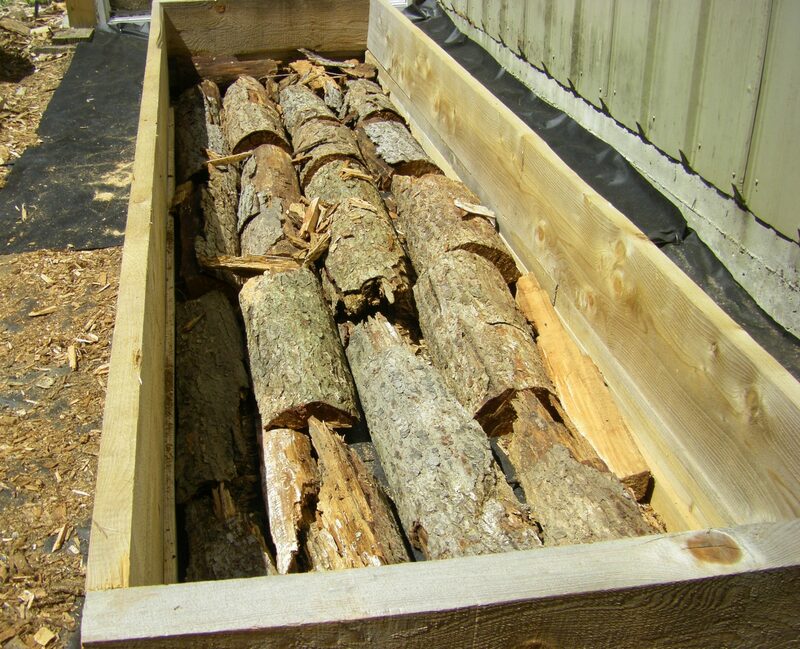 The bottom layer is made of up logs which can be laid out lengthwise or cut into blocks and put on end. The logs and branches are like a sponge. They store water which can be used when it dry. Very useful in areas that don’t get a lot of rain. 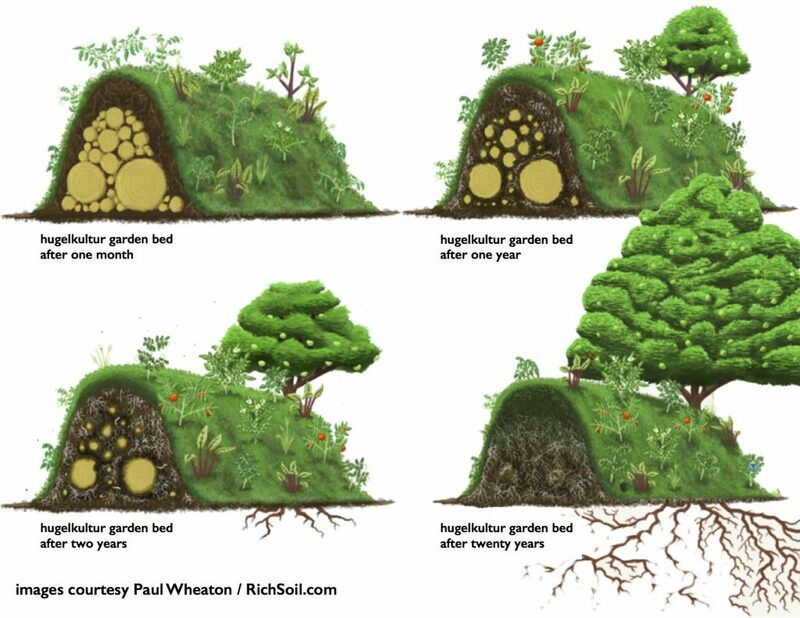 I’m thinking that hugelkultur is almost like a huge compost pile that you just add a little dirt to and plant on top. The reason I got started on this was by looking for some information on gardening at some point and saw this method. It reminded me that we had a few logs laying around that were decomposing to the point that if you moved them too much they would break apart. I thought… what a great idea and a way to recycle rather than burn them, but had no plans for another garden bed so they just sat in the yard. Spring forward to last Sunday when Rob cleaned out an area beside our big greenhouse and decided I needed another raised garden bed. That make 15 to date. 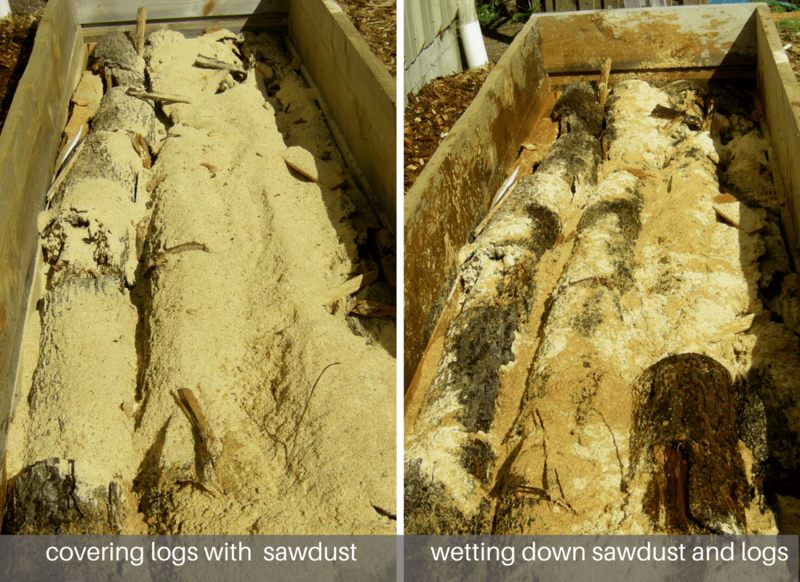 And I thought what a perfectly good chance to use up the logs and also there was the benefit of needing less dirt. To start the process, we cleaned up the surface and laid down landscape tarp over the whole area to stop any weeds from growing around the garden before we started building the bed. We have the added benefit of having our own sawmill but the disadvantage of not always having the right size board for the job. Note: I’m an inches and feet type of gal if you want metrics here is a converter. 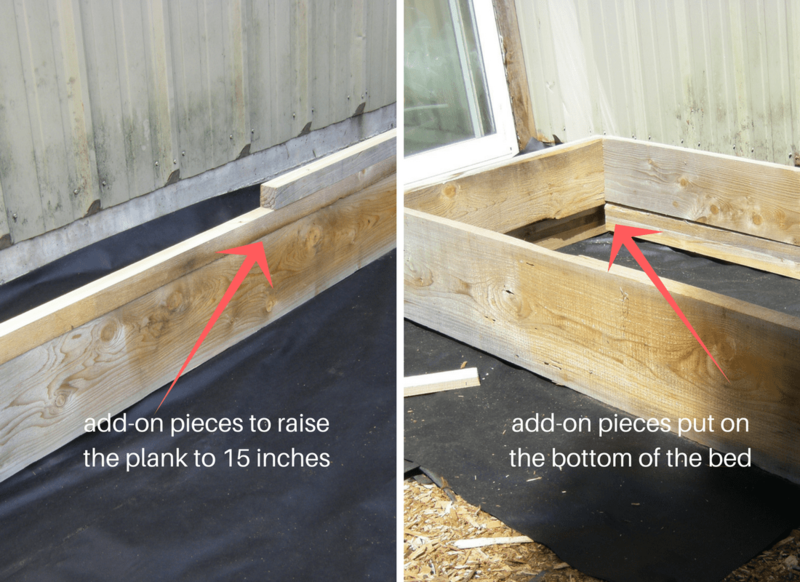 Starting with one plank 15 inches high by 12 feet long and 2 inches wide it formed the basis for one side of the box. For the other side we only had a plank that was 10 inches high by 12 feet long so without having to go and cut another plank here is where the MacGyvering came into play. Using some additional wood we had on site, Rob ripped them on the table saw into 2.5 inch pieces. They weren’t quite as wide as the 2-inch planks, but that didn’t matter very much as we put them at the bottom. 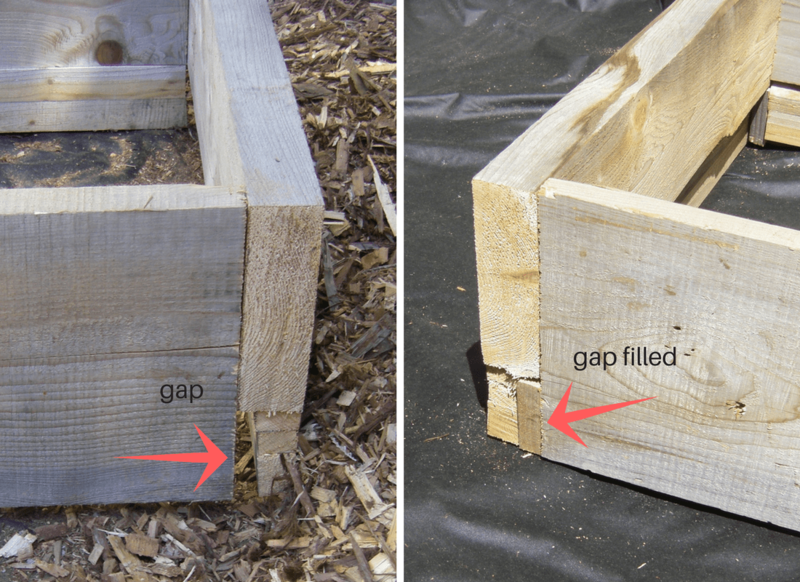 The reason that we put two layers was so that the first layer could be screwed in the plank and then the next layer could be screwed into the first one. We didn’t have screws long enough to go through 5 inches and still make a good solid wall. Once the back wall was finished we did the same thing for the 2 ends to make them 15 inches high. 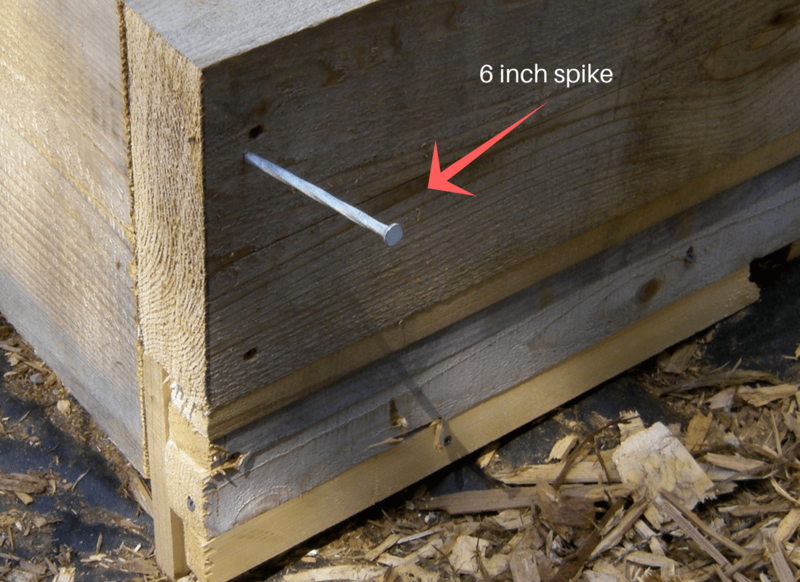 When all sides were nailed in place using 6 inch spiral spikes there was a little gap in the corners due to the extra 5 inches that were put on being a little shorter than the 2 inch width of the planks, so we just cut some little pieces of wood and tapped them into place with a hammer. And that’s how you MacGyver a raised garden bed when you don’t have the exact supplies that you need. So when the bed was completely finished it was 3 feet wide by 12 feet long. The reason I went with 3 feet is that a lot of my beds are 5 feet wide and it’s hard to dig a hole or reach the middle. What can I say… I have short arms. Three feet is perfect for working all the way around the bed without having to strain your back. 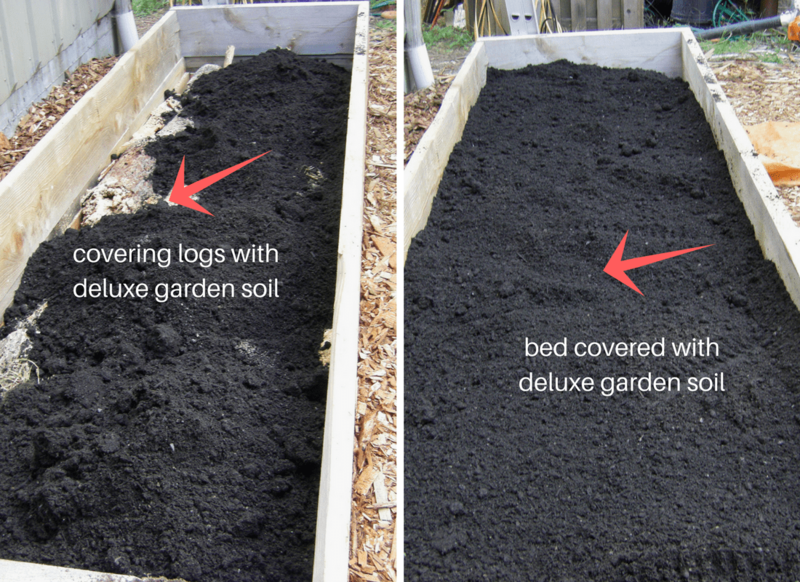 The first layer that went into the raised bed was the punky logs that we had laying around. Rob cut them in half lengthwise and we put them into the bed as you can see below. They filled up the whole box except for one little spot in the top corner where we threw in some scraps of wood that were lying around. This layer consisted of some sawdust that I have left over after doing my strawberry and herb gardens. I would have like to put more on or even some wood chips that we had laying around, but the wood chips were cedar and not good for a garden. After that, we wet down the wood and sawdust really well and on Monday the dirt arrived. This layer consisted of purchased garden soil. Not just any garden soil but deluxe garden soil and not a worm in sight. Having experience with purchasing garden soil before (you can read about it here) I had kept a secret weapon especially for this purpose. Over the years we had planted trees in pots of all different sizes and over the years, some didn’t make it through the cold of the winter or dried out in the summer. This year, I cleaned out all the dead ones gaining not only three wheelbarrows of soil but also got enough pots to plant my tomato seedlings into before they went into the garden. The soil that came out of the pots was full of life and worms abounded and I was wondering what I was going to do with it. It became the fourth layer on top of the purchased soil and although it doesn’t look as nice or as rich as the deluxe garden soil, I know that it is a viable growing medium that will produce vegetables this year. I didn’t get a chance to plant yesterday but that was just as well. Today we had some lovely rain with the occasional heavy downpour that settled the earth in the bed and moistened the soil. Tomorrow will be planting day and it will be a bit of a hodgepodge as it will get all the leftover transplants that I have in the greenhouse which will give me an idea of which vegetable will grow the best in the bed as it mainly gets the sun around noon until it goes down at night. I will probably end up using it as a winter garden bed as it gets the sun first in the winter months. I think it’s called… as the world turns.